Note: This doc shows instructions for the most up-to-date version of ShortStack. If your Templates Manager doesn't match these screenshots, click the Switch to New Templates Manager link in the top-left of the screen. Click Other in the main menu, then click Templates in the drop-down. The Templates Manager houses all of the templates that you've set up using the Campaign Builder. There's also a button that opens up the Public Templates gallery. If you hover over the template's name, you'll see an edit icon to the right; click this to rename the template. You can also click the name to do the same thing. Type the new name, then click the blue checkmark button to lock it in. There's also a drop-down menu on the right with more options for managing the template. By clicking the drop-down menu on the right-hand side of any template, you'll get these additional options. Click this option to open the template in the Campaign Builder to make any alterations to the template itself. If you're using ShortStack for Teams to grant access of your templates to other teammates, clicking Permissions is where you can set the specific access levels for your team members. By clicking Delete, you can remove the template from your account entirely. This doesn't remove the campaigns that are using the template - just the template itself. Note: Deleting templates is permanent, so make absolutely sure you no longer need the template before completing the deletion. Use the Search field in the top-left corner of the page to look through your templates using a single word or phrase. The Tag field allows you to search through your templates by simply typing in a tag that's attached to one or more templates. Your results will automatically be displayed on the right. To sort the templates, click the button next to the number of templates at the top. Your options are to sort your feeds by Recently Edited, Newest, and Oldest. There are a couple other options available when working with templates; you'll see the bar appear up top when you've clicked one or more templates to highlight them. Clicking the Tag button will allow you to add tags to all of the selected templates. It also has an area that shows you all the tags already applied to the templates. Just type the tags you wish to add (with a comma between each) and then click the blue Save button. The other available option is just another way to delete templates; if you'd like to delete multiple templates at once, click each one to highlight it, then click the Delete button up top. 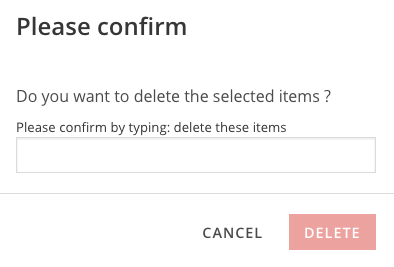 You'll be asked to type in a short phrase to confirm, then click the red Delete button to finalize the deletion. Note: Again - deleting templates is permanent, so make absolutely sure you no longer need the templates before deleting them.